Green living is the future and Simply Living members are leading the way. We have curated a highly diverse selection of homes and garden experiences designed to help you learn from some amazing pioneers in sustainable living. You can visit the forest garden of Deb Knapke, central Ohio’s Garden Sage, and be inspired by her passion for ecological sustainability. Discover how permaculture design has transformed a modest backyard in North Linden. Find out how neighbors helped install solar panels in Clintonville. Learn about the latest solar technology and EV cars from an electrical engineer. Hear how Jodi Kushins grew her garden into Over the Fence Urban Farm. Don’t miss Arter’s Garden (short Broad & High video from PBS) in Old Town East, where an artist’s touch has created an “East Meets West” design anchored by a Japanese Tea House. The self-guided tour offers a unique opportunity to learn “what’s next” in your own home. A butterfly garden? Beekeeping? Native herbs? Or perhaps solar panels? an electric car? Get answers from home owners who can make your transition to green living an enjoyable experience. It’s social too. Food, music, art, and literature on sustainability will enhance your experience in several locations. The Tour will take place rain or shine! You may attend all homes on the Tour or just the ones you choose. See details on each venue below. We have lived here for 34 years, during which the garden has evolved as I have. Many of my grandiose ideas have mellowed and what you see is a more reasonable expression of my dreams. Today, my 2/3 acre garden is used for research, teaching, testing design ideas, and enjoying. I practice ecologically-conscious gardening – my term – as I have come to realize that nature is my partner in the garden; and often my primary teacher. Tony and I love stone. The stone walls and beds have wrapped around the house as time and money have allowed, starting at the front and progressing around the west side and to the back. One of my longed-for hardscape additions are terrace and nursery at the southeast corner of the house and the tea house in the back. The nursery has aged and is in need of repair… next year. There are 26 different garden areas consisting of shade gardens, sun gardens, herb areas, rock areas, an in-transition conifer garden, a vegetable garden, a new forest garden and more. There are approximately 30 troughs, numerous container vignettes, a greenhouse and several artworks. Tony and I created the ivy window and the sun sculptures at Hammersong Farm in Mt. Vernon, and I have several stone carvings scattered in the beds. There is something going on all the time, even in winter. The subtle beauty of winter is just as welcome to me as the emerging life of spring, the hot colors of summer and the russet splendor of autumn. Please enjoy the diversity of our garden. Deb is known as the :Garden Sage and you can often hear her on All Sides with Ann Fisher whenever the topic is her passion: gardening! From Julie and Elizabeth. Welcome to our grid-tied, Solar Powered Home. We decided to get solar panels 3 years ago after wanting them for quite a while. We feel motivated to do what we can to care for the earth and we experience solar power as one of the “solutions multipliers”. It is also a lot of fun, our electric bills are lower (sometimes $0), and we get to help show that Solar really does work in Ohio! Our involvement with the Clintonville Energy Collaborative (CEC) combined with the price coming down on solar components, and the federal tax credit, allowed us to make our solar dream a reality. Come by our 1,360 ft2, cape cod style, home to learn more about our system and how we helped install it with certified solar installers and our friends from CEC. We will also display a list of the energy- efficiency steps we took ahead of time to prepare for the installation and the amount of money we save on our electric bills. There will be electric vehicles, an electric bike, an electric lawn mower and a solar oven on site for display only. Note from Simply Living: A 2018 Chevy Bolt owned by Simply Living Board President Dan Barash will be on display from 1-3 pm. A 2013 Nissan Leaf will also be on site, owned by Chuck Lynd. An EBike from nearby Orbit City Bikes will be on display. A solar oven and a battery operated mower will also be in the front yard. A handout that explains the process of Going Solar from start to finish will be available. There will also be music in the air performed by Judy Fasone and Steve Rendina from 12- 2 pm. Refreshments from our gracious food donors will be sure to please, including veggies from Great River Organics and cookies from Pattycake Bakery. From Jodi on her blog: We live on a small patch of earth on the northside of Columbus, with family roots dating to Dan’s grandfather’s purchase of our 1949 home and a tradition of backyard gardening and indoor preservation of the fruits of the garden. We took over the tradition when we built a single raised bed for tomatoes, cucumbers, and zucchini. Nearly ten years later, we found ourselves with three raised beds and a cold frame where we were growing a wide variety of greens, onions, tomatoes, and other summer favorites. We have beds dedicated to asparagus, blackberries, and a few grape vines. We experimented with rain harvesting, composting, and tucking herbs, garlic, and greens into our flower beds. You could say we caught the edible landscaping bug. Note from Simply Living: Food donations include”No Tuna” from Portia’s Café, Chef Del’s Healthy Snacks, and cookies from Pattycake Bakery. Music will be provided by Joanie Calem starting around 10:30 am. See Joaniecalem.com for more info. In the afternoon, the amazing young fiddler extraordinaire Kai Grosklos will perform. Visit Jodi’s Over the Fence Urban Farm blog HERE and enjoy pictures of the farm and learn about her work with the Clintonville Farmers Market Kids Garden Club, her CSA (Community Supported Agriculture), Recipes, and more! Sunny Glen Garden is an urban demonstration food garden, wildlife habitat, monarch waystation, and native bee sanctuary, with a honeybee apiary. Organic permaculture methods that are simple, low cost, require minimal care, and produce a lot of food are used, that can contribute to the health and wellbeing of people, wildlife, and the planet. Native plants and companion planting have been incorporated to attract pollinators and other beneficial insects for optimal growth and to control pests without the use of chemicals. The garden is no till, utilizing lasagna layering. A baby perennial food forest of chestnuts, hazelnuts, raspberries, currants, and gooseberries is growing within a small radius appropriate for backyards and will provide protein, fruit, and wood for self-sustainability once established. These natural methods help Dianne and Stephen live towards a zero waste lifestyle, as featured on 10TV and in the Columbus Dispatch, as grass clippings, leaves, kitchen food scraps, cardboard, and newspaper advertisements, are prevented from going into the landfill and used directly in their garden to enrich and improve soil tilth, reduce watering, and the need for weeding. A small in-home seedling operation in the basement, and handmade cold frames made from repurposed materials to transition plants outside, allowed them to raise 2000+ seedlings for their annual organically grown vegetable, herb, and flower plant sale this year, and donate 800+ plants to local schools, organizations, and community gardens. Paper origami pots were folded from recycled newspapers by volunteers to replace 1000+ plastic plant pots so they could be washed and reused to reduce costs, and so customers could take their seedlings home in their paper pots and plant them directly into their gardens. Sunny Glen Garden is a City of Columbus Green Spot Business andprovides education events and tours on permaculture gardening, native pollinators, organic pest management, community backyard water conservation, and has been nominated for Franklin Park Conservatory’s Growing to Green Education Garden of the Year for 2018. Plus, we just learned that Sunny Glen Garden earned 3rd place in the Columbus Dispatch Home and Garden show for Best Vegetable Garden! Parking: You may park in the NE corner of the Kroger lot and walk to the house. If you know Clintonville, take Orchard Lane from N. High St to Milton, turn left twice and park on the street near 105 W. Kenworth Rd. Or, turn north off W. N. Broadway onto Milton (one traffic signal west of High St. & N. Broadway if westbound on Broadway, or one signal east of 315N entrance ramp if eastbound). After turning on Milton, go one block to the stop sign which is W. Kenworth. Turn right and go about 100 yards to 105 on the right (2-story yellow house with yard sign: WGRN, A Voice for the Planet). Parking on either side of the street is OK.
7 kW solar installationwith battery backup. System utilizes a mixture of differently sized panels to optimally cover the hip roof (with south, east, and west-facing triangular slopes). Discussion of the various types of solar panels and inverter equipment available on the market. • Examples of efficient lighting throughout the home, including discussion of directed lighting of variable beam widths to aim light only where needed. Lamp technologies include halogen IR, fluorescent (comparing T12, T8, T5, and CF bulbs), LED strip lighting, LED directed lighting, filament LED lighting. Discussion includes light spectra of the different bulb technologies, advantages/disadvantages of low-voltage vs. line voltage halogen, health effects of concern with most LED lighting, safety concerns with some bulb types. • Pellet stove fireplace insert that provides convective and radiant heat. Stove fits in our shallow fireplace cavity, common to many older homes. • Measurement and reduction of parasitic electrical loads of appliances and electronic devices. • Occupancy sensors and timed interval switches to conserve electricity. Eugene Beer is a retired electrical engineer (Lucent & AT&T) who volunteers his time with local WGRN FM 94.1 radio station by maintaining the broadcast tower and solving the technical aspects of transmitting the signal over the air and online. Eugene is currently studying Climate Change at OSU towards becoming a climate science journalist. Food donations: 7 layer dip with chips and crackers from Portia’s Café and cookies from Pattycake Bekery. 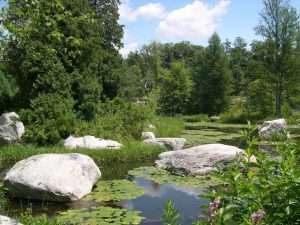 For over 30 years, the home owners have built their yard into a certified wildlife habitat and natural landscape that includes two ponds and a waterfall, bridges that take visitors over dry beds, mason bee houses, a gazebo for viewing, granite, Jade and sand stone benches, granite sculptures including a lighthouse and other interesting artwork tucked away in the landscape. In the garden, there are bird baths, feeders, nesting materials and perennials for butterflies and hummingbirds. A miniature conifer garden sits near a fire pit. There is a garden shed and compost bins. We’ve done the work ourselves and are finally spending time enjoying it! Recently, the garden won third place for best landscape in the Dispatch backyard garden awards. There were 200 entries and 300 photos submitted. Food donations: Small bites from Acre, Healthy Snacks from Chef Del of the Wellness Forum, and cookies from Pattycake Bakery. Artist Ann Raver will arrive at 10:30 am to paint in the gardens. Arter Gardens is a woodland perennial garden – a “secret garden” nestled in the heart of Olde Town East in downtown Columbus, accessible from the freeway and just 2 miles east of the Ohio Statehouse, with plenty of on-street parking. Gravel is used to form pathways throughout the garden, and visitors walking slowly and mindfully will notice many images, sculptures, and rock formations amidst the trees and greenery. A wrought iron tented Gazebo area is surrounded by flowerbeds and trees with a table and chairs inside. A goldfish pond and small waterfall are nearby. A Japanese Tea House anchors the garden consisting of one 10′ X 16′ wrought iron frame with four sets of French doors that open onto a 5 ‘ deck on the front and side of the Teahoouse. Surrounded by trees, a small pond, and rock gardens, the setting provides privacy and intimacy for the owner and contemplative visitors alike. Note from Simply Living: Tables will be available near the house for light food and refreshments donated by our sponsoring vendors. Enjoy vegetarian sushi from Karyn Deibel, falafel and hummus from Portia’s Cafe, veggies from Great River Organics, and cookies from Pattycake Bakery. Susan Schubet of Artists on the Move will be painting in the garden from 10 am – 12:30 pm. Music will be provided by violinist Susan Walsh from 1 – 3 pm.